The North or Grand Parade was planned as an extension to the city, on a marshy plot of land leading down to the banks of the River Avon. After the site was drained, work was started on the houses along the parade in March 1740. 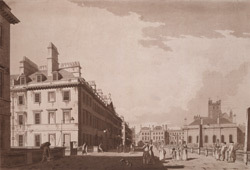 The Palladian scheme for the parade, Pierrepont Street and Duke Street was designed by James Wood the Elder. The north and south parades have since witnessed majory alterations: modern shop fronts have been established, sash bars removed from windows, and the original stone balustrades which surrounded the house fronts have been replaced by iron railings.